Be the first to share your favorite memory, photo or story of Effie. This memorial page is dedicated for family, friends and future generations to celebrate the life of their loved one. Effie was born in Portland, Oregon, to Clifford Joseph and Eva (Dodge) Heuer. She was raised with eleven siblings in the Portland area. When she was about 17 years old, she headed to what is now the Sheridan area to live on her future father-in-law’s homestead on the Gooseneck Creek. It was here that she met and married Andrew Jackson Kosack. The couple stayed on the homestead and started a family. They had a daughter, Rolanda Marie that was killed in a tragic accident at the age of just two years and 21 days. It was quite a blow to the young couple and several years before they had three more children. The family was a typical farming family with a milk cow, a horse, lots of chickens, and a huge garden for canning all of their own food. They raised their own meat and hunted for deer and elk. The kids played along the creek and in the woods. Effie was a wonderful homemaker and an excellent cook. She loved the farm life and was proud of her beautiful garden. A couple of times the family set out to live in other places, like Netarts and Gates, but each time it was for a short lived few months before they were back at the farm they loved so much. They sold the farm and moved to Idanha in 1968. The couple split when the kids were teenagers, and Effie stayed single for quite a while until she met and married Glen Madsen in 1975. In 1998 she sold the house in Idanha and moved to Mill City. They were married until Glen passed in 1990, and again Effie remained single until she passed. Although she was not married, she was not alone; her daughter Georgia lived with her and cared for her until Effie went home to heaven. 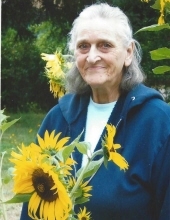 Effie was an artist and loved to paint, create bead work jewelry, crochet, and paint table cloths. She would sell her creations at local flea markets and town fairs. Kids loved her, especially her grandchildren, and she was always making them special things. Effie had a sweet spirit and was loved by everyone that knew her. She was always loving on and helping people. Effie was preceded in death by her parents, husband Glen, and daughter Rolanda Marie, as well as a number of her siblings. She is survived by her children Andra Kosack, Georgia Kosack, and James (Vickie) Kosack; 7 grandchildren; 20 great-grandchildren; 7 great-great-grandchildren; half-brother Ted Haeuer of LaPine; and step-sister Loda (Bob) Newbill of Sheridan. A Celebration of Life will take place on Saturday, February 16, 2019, at 2 p.m. at Mill City Presbyterian Church. A reception with refreshments and a time of fellowship will follow the service. To send flowers or a remembrance gift to the family of Effie Joanne Madsen, please visit our Tribute Store. "Email Address" would like to share the life celebration of Effie Joanne Madsen. Click on the "link" to go to share a favorite memory or leave a condolence message for the family.